Ceriale is one of the most popular holiday destination in Liguria, Italy. The Albenga plain is enclosed to the east by Monte Croce (541 m.), near the coastline where Ceriale is located. 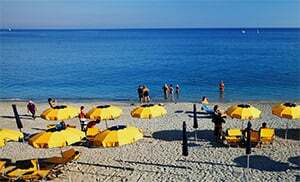 This seaside resort has excellent tourist facilities and is one of the most popular holiday centers in Liguria. The hinterland area is dominated by Mediterranean maquis vegetation, interspersed with cultivated flower and vegetable fields. The vineyards form part of the Pigato superior wine territory. The valley of the River Ibà attracts many botanists since it has a natural microculture of Alpine vegetation that is rather unusual at an altitude of only 200 metres. The basin of the River Torsero is a regional park area considered to be one of the most interesting fossil and archaeological areas in Italy. Many of the finds made during excavations are kept in the museum in the municipal district of Peagna, a relatively new town that grew up following the total depopulation of smaller local districts, such as Capriolo (whose ruins can still be seen). Of interest are the fourteenth-century church of San Giovanni il Vecchio and the medieval fountain called "Anthia", which gives its name to the Liguria's Book Prize and which is also connected with the Ceriale Prize for the paintings that best represent the Ligurian landscape. Before becoming part of the Republic of Genoa, the town belonged to the archbishop of Albenga and has fortifications dating from 1564, which were built as a defense against Saracen invasions as was the slightly later watchtower which is the only holdover. The beach is almost entirely composed of sand, with just a few pebbly areas; the sea-bed is also sandy and is suitable for divers. A good alternative to the beach is the Aqua Park, which is not far from the town centre and is served regularly by a special bus. Ceriale is one of the villages in the province of Savona, which lies in the Liguria region. There are several other villages near Ceriale, and they include: Albenga (6.1 km), Campochiesa (4.7 km) and Borghetto Santo Spirito(1.6 km). When coming from Genoa, follow the highway exit to Borghetto Santo Spirito and take the SP1 up to the SS1, then turn right and drive up to Ceriale.